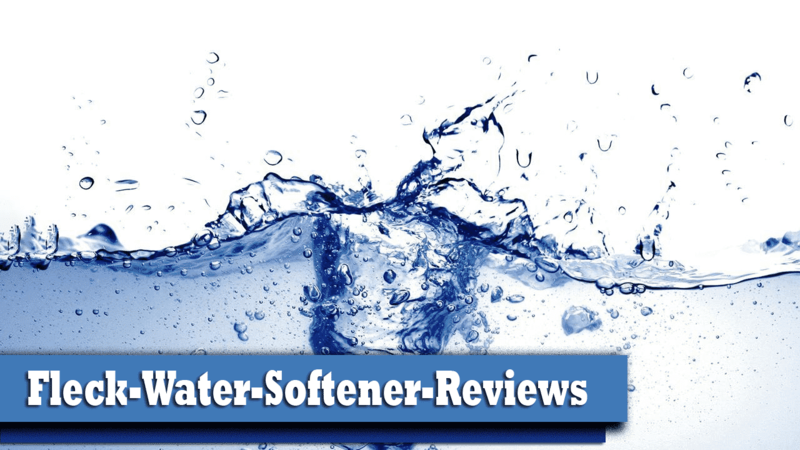 Fleck Water Softener Reviews 2019 – Which System is Right for Your Home? Have you ever noticed that your water has a bad aftertaste after you drink a glass? Maybe it has a bad smell? It may even be the case where it takes you forever to wash the shampoo out of your hair. These are all signs that the water in your house has a very high mineral content, which means ‘hard water’ is continuously running through your home water system. In excess, these minerals are not good for your health, the cleanliness of your home or for the plumbing in your house. Fortunately, there is a solution in the form of water softeners that will help eliminate these harmful mineral deposits. Of all the water softeners that are out there in the marketplace, the type of systems that are most recommended are the ones that use Fleck Water Softening technology. Fleck is one of the top brands when it comes to water softeners. They have different models for different types of houses and needs, and comes in different capacity variants. If you have done an online search before about which water softener systems to choose for your household, I’m pretty sure you have come across Fleck water softeners, and according to my own tests, they certainly deserve that recognition. That is why our team have taken the time to do several brief (straight to the point) reviews of Fleck Water Softener systems in this article, so as to help you choose the right Fleck water softener system for your particular needs / type of house (more water softener reviews here). Without further ado, here we go! 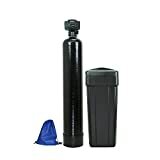 Which is the Best Fleck Water Softener in 2019? 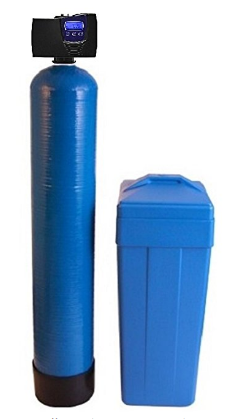 Why Go for a Fleck Water Softener? Which is our #1 Fleck water softener model? Fleck 5600sxt Digital on-demand Metered Water Softener with paddle wheel meter (BR5600SMS-SXTPW), Made in the USA. Complete System for your whole home: Includes tank, control head, resin, and brine tank. Just set it up once and add salt. You are all set. Will treat up to 12 gpm service flow rates (28 GPM at peak). Perfect for up to 6 people in home, 4-5 bathrooms. Can treat high levels of water hardness too. Efficient and Hands Free Maintenance: The system uses a flow meter to measure the water used and regenerating as needed. saving salt and reduce waste. LCD Digital display and touchpad controls. Several fully programmable water softening cycles. Maximizes both water and salt consumption. Saves you both salt and water in the long run. Affordable pricing: Budget friendly doesn’t mean bad quality. It’s the most efficient softener on the market right now. Over 400 5-star reviews on Amazon across different models available. Evidently, customers love it so much. 48,000 grain or 1.5 cubic feet of high capacity resin. You can go for the 64k grains model if it’s not enough for you. Upto 6-7 bathrooms. Hard water is something that you should not want to or have to live with. Water softeners (Ref: read how does a water softener work) like the Fleck models we will review here can easily condition all the water in your home that you use daily. As was mentioned, hard water can make a negative impact on your health and make your home hard to clean and maintain. You wash your hands for a long time and still feel a film on them (hard water turns soap into soap scum). Just washed glasses and dishes look like they have spots and residue on them. You have hard to get off soap scum in sinks and bathtubs. Many family members have dry and itchy skin. It takes more soap to wash dishes and more detergent to get your clothes clean. Your hair feels dry and brittle even after shampooing it. You see scale buildup around plumbing pipes and mineral deposits around kitchen and bathroom fixtures. Who can benefit from having a Fleck Water Softening System? The answer is everybody. People think that only those homeowners that have their water supplied by wells are subject to having many minerals in their water, but that is simply not true. Even those on city water are by no means immune to having hard water problems. So basically anyone with any type of water can benefit from having a Fleck Water Softening System. A Fleck Water Softening System (sometimes called a Pentair Water Softener) does so much more than your standard household water softener. All water softeners basically use a three cycle system to take the hardness out of the water that passes through them. This is the initial cleaning of the water that passes through the water softener. It removes any large contaminants or dirt that is present in the water. Every water softener uses salt to make a brine solution. When this brine solution is added to the incoming water in this phase it forces all the unwanted magnesium and calcium out of the water. These byproducts are then flushed completely out of the system. Lastly, all the residue is discharged from the system and more water is added to make a new brine solution. A Fleck Water Softening System uses the exact same process. It just does it more effectively, more efficiently and more economically. We have already talked about our most recommended model Fleck Water Softening System but let’s look at it in a little more detail. This is a very high-efficiency product that is built to last you well into the future also. 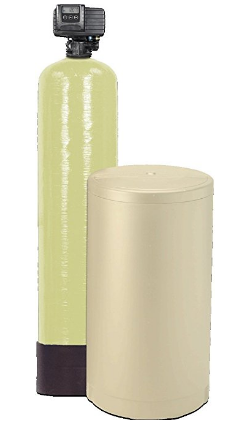 We were all very impressed with this model water softener because there is just so much to like about it. One of the best features about this product is its fully programmable control head. It has an easy to understand and use all digital control panel. You can pick and choose from many different preprogrammed settings and then adjust them as necessary as you learn to tailor your soft water to your particular needs. You won’t find many Fleck Water Softening Systems that are easier to use than this one. What else is there that we really like about it? 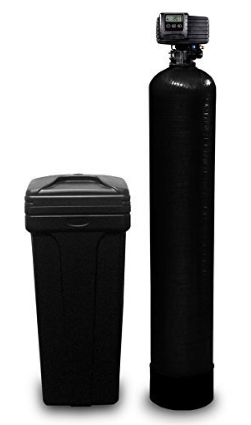 This water softener can maintain a flow rate of 12 gallons per minute as you use it. That means under normal circumstances you will never have to worry about running out of soft water in your home. Its brine tank can hold 250 pounds of salt, and inside the main tank, it has over 1 ½ cubic feet of 8% fine resin that is used for filtering out unwanted metals. It’s a very well-built and durable system, to say the least. Much of this is due to the fact that the main supply tank is made from the virtually indestructible polyglass material. Even the programmable control head on it is made using sturdy PVC plastic and comes with a full 5-year warranty. This water softening unit should definitely last you a long time. There is virtually no setup required with this water softening system. Once you make a few simple connections and then hook up the incoming and outgoing water lines, you are in business. Put in the recommended amount of salt and you can say goodbye to nuisance hard water problems for as long as you own and maintain this unit. This is a really well-designed system that will help treat the entire incoming water supply to your home. No more worrying about super resilient soap scum on your toilets and sink basins and glasses that look dirty no matter how many times you wash them. 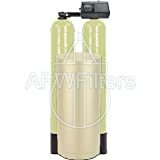 This entire household water softener will take care of hard water issues such as these very easily. The dual tank capacity of this unit is really nice to have, and it gives you many advantages. Because each side of the tank works independently of the other, you can rest assured you will always have a fresh supply of the soft water you love ready to go. This is a larger sized unit so will have to make sure you have adequate space to set it up before purchasing it. Among the other nice features that this system has are such things as a digital control head with a long lasting polymer body and a generous size 1 ½ cubic feet of resin per tank. This system is also known to be highly efficient, and that means it will use less salt and consume less water than many other types of Fleck Water Softening Systems. Basically, everything that comes with this system is ready to set up. Except for a few small tasks it is ready to be connected to the incoming and outgoing plumbing. The do it yourself instructions are straight forward, and you don’t have to be mechanically inclined to accomplish them. If you are tired of seeing your white clothes turn brown after you wash them, then this might be the perfect water softener for you. Not only does it do a great job of taking minerals out of your incoming water but it does an especially good job at removing troublesome iron. Once you hook up this system, you will never have to worry about ruining that expensive white dress or white shirt again. 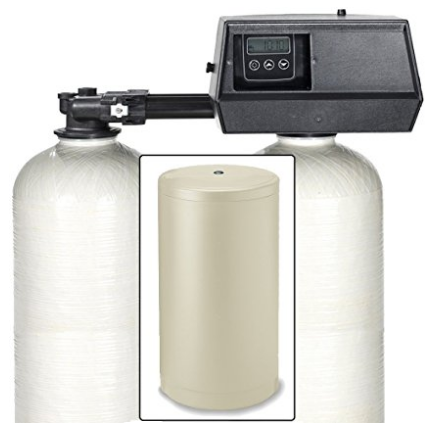 One of the best features of this water softener is its higher than normal flow rate. It has an outstanding 16 gallon per minute flow rate. This makes this unit the perfect system for larger size homes or homes that have many occupants in them. That way you will not have to worry about running out of filtered and treated water. This is true even when many people are using multiple bathrooms at the same time. Among the other well thought out features on this unit are it’s easy to use digital control head and its time-tested main control valve. It also uses a very high-grade fine mesh resin to further enhance the treatment process. You definitely want a water softening system that is easy to control and maintain, and all of these features will help give you that. The main tank it comes with is very durable and built to last too. It measures 12 inches in diameter by 48 inches in height and holds some 64,000 grains of fine mesh resins. The tank and the rest of the system components are built to last too. For added peace of mind, there is a 5-year warranty on the system control head and a 10-year warranty on the main tank too. This is not the easiest unit to set up, and part of that is due to the somewhat vague instructions that come with this model Fleck Water Softening System. Despite that, we think it will take a slightly mechanically inclined individual 2 -3 hours to have this system set up, plumbed and running. Here is yet another Fleck Water Softening System on our top model review list that not only does an exceptional job softening your water, but also is very good at eliminating bothersome iron problems in your water. There is no doubt about that iron is one of the worst metals to have in abundance in your household water. Among the nice features on this unit, besides the way it eliminates stubborn metals like iron, is the fact that it uses the time tested and popular Fleck 5600SXT digital metered valve. This makes fine tuning your water to just the way you like it extremely easy. The fact that it is a metered based control system also makes this unit very efficient and economical to run. We all really liked the operating features of this model Fleck Water Softening System. This is a good working 48,000-grain water softening system. That is a very high amount of contaminants and metals this system can filter out before the filter media needs to be replaced. That helps make this unit very worry free and very easy to maintain. The less work you have to do to keep your household water soft the better. This system is a little bit smaller in size, so it is perfect for small homes and homes that do not use a huge amount of water from several sources all at the same time. The smaller size is also great if you want a new water softening system but are limited in space. You will also probably have to watch some YouTube videos online to get help with setting it up because the directions that come with it are very poor. Here is ABCwaters offshoot of Pentair’s version of the 5600SXT Fleck Water Softening System. They have made some improvements to this system and have included some nice freebies in with the kit too. In other words, they have taken an already proven good product and enhanced the buying package that you get from them. That is never a bad thing when you are comparison shopping. 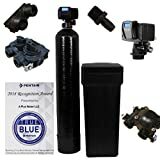 What makes this Fleck Water Softening System stand apart from others that are similar to it? Well, for one thing, ABCwaters has an excellent reputation for bringing these systems to you at an affordable price. The fact that their kit includes some things such as a hard water test kit and an upgraded model water softener only makes buying from them that much more appealing. Another thing that sets this kit apart from the other 5600SXT kits is the fact it includes a special brine feeding line and a system sanitizing packet. Even the setup manual is special because it was written by ABCwaters factory trained installation personnel. One of the biggest complaints with any 5600SXT mode is that the installation instructions are poorly written. That is not a problem with this model water softener. This system also uses the same great 5600SXT control head that many other systems have used successfully and also has the same durable polyglass tank that comes with it too. This system is able to produce 12 gallons of water flow per minute and does so in a way that is efficient and economical. If you have a big family or use lots of water in your home, then this just might be the very product you need to turn that nasty hard water of yours into much more appealing soft water. It will remove almost 100% of the fine metals in your water that causes stains, soap scum and make your dishes hard to get looking clean. We all were very impressed with this large capacity water softener. What is there to like about this fine Fleck Water Softening System. It all starts with its exceptional 28 gallons per minute water flow. This enough flow to keep soft water easily supplied throughout your home even if several bathrooms are being used at the same time. It even back washes the system at a rapid 7 gallons per minute. This unit also has a very well-designed control head. It features up to 5 programmable filter cycles that you can control. The control head also features a very large and easily readable display that you can set to show you metered water usage or its timer function. This display is built out of solid PVC plastic, so it will hold up well for a long period of time too. What else is there to like about the 7000SXT Water Softening System? We like how easy it is to set up compared to some other the other model Fleck water Softeners that we reviewed. It comes with some very good installation instructions, and the kit it comes in has everything you need. That includes the main tank, the brine tank, the control head, a bypass valve and all the necessary plumbing connections to the unit itself. There is no doubt about it that this is one of the better designed higher capacity Fleck Water Softening Systems. There was simply a lot to like about it. We can easily recommend this model water softener to anyone that has a large family or a large home that has several bathrooms. Here are some of the big advantages to owning a Fleck Water Softening System as opposed to a more generic type water softener. They filter out almost 100% of unwanted metals and minerals in your water supply. The resin filter media in them lasts a very long time between changes. They are efficient and very effective systems. Most of these systems can be installed by even a slightly mechanically skilled person with a little help from online instructions. These water softeners require very low maintenance in most instances. They are fully programmable so you can fine tune your water quality to meet your individual needs. These are devices that have been certified to be eco-friendly and do not harm the environment in any way. They are very affordable water softening systems when you take into consideration how much they enhance your life with their many benefits. Most of the Fleck Water Softening Systems that are in the marketplace are similar in nature. With that in mind, there are some subtle differences that make one system better than another for your needs. There is some pretty good variety when it comes to pricing as far as water softening systems go. These Pentair Water Softeners can run from well under $1000 to over $2000 depending on the model of system you buy. With that being the case you certainly don’t want to get a system that is too large for you because you will waste money. These are high enough price ranges that you should also set a shopping budget for your new Fleck Water Softening System purchase. This will help keep you from wasting time looking at Fleck Water Softening models that you will never consider buying in the first place. Once you have determined your spending budget, next take a look at the rest of the characteristics of these fine water softeners below in order to decide which exact unit you will buy. This is one of the most important characteristics of Fleck Water Softening Systems to consider when buying one. It is an absolute must that your system be able to handle supply the soft water needs of your home during peak usage hours. That means a 48,000-grain water softener will be great for a two bedroom home with a family of three but will not adequately meet the needs of a seven-member household that has 4 bathrooms in that home. So pay very close attention to the size of the Fleck Water Softening system you are thinking about purchasing. Having too big of a system may cost you some money you didn’t need to spend but having too small of a system may not adequately meet the needs for why you purchased a Fleck Water Softening System in the first place. We cannot stress the importance of correctly sizing your water softening system enough. Get help with sizing from a salesman when you are in a store or speak to a tech representative of the company if you are buying online. Having a nice programmable control head with your Fleck Water Softening System is a nice thing to have too. That will allow you to somewhat customize the softness of the water in your home to your needs. The better control heads will have at least 3 different preprogrammed control settings on them. You also want your control head to have an easy to read display and operate by using soft touch buttons. The information on it should also be displayed in such a way that it makes the control head easy to operate. A control head that is made out of sturdy PVC plastic will also help that control unit last you a long time too. Knowing the flow rate of any Fleck Water Softening System you are considering buying is extremely important too. This almost goes hand in hand with the size of the unit you will buy. Typical flow rates on these types of systems are from 12 to 28 gallons per minute. If you have a smaller size home a model Fleck Water Softener with 12 gallons of flow per minute will probably work fine for you. Big homes with large families in them will most likely need a flow rate in the 20+ gallon per minute range to keep everyone in your home supplied with soft water at peak usage times. Many people who are not familiar with water softeners think each Fleck Water Softening System uses a different filter media. That is really not the case because each one uses what is known as a fine mesh resin filter media. The truth is, except for very minor differences these resin filter media’s all basically perform the same way. This does not mean you should not factor the mesh resin filter media into your buying decision because the capacity of it is very important. The more filter media you have, the more contaminate particles and metal it can filter out of your water before you need to replace it. So in other words, the more filter media that is present in a Fleck Water Softening System, the less maintenance that system is in most cases. This water softening units are by no means a disposable item so you better make sure you get a good warranty with the Fleck Water Softening System that you purchase. Although these operate very basically there are still some parts in them that you would not want to have to replace with money out of your own pocket. The longer the warranty you get with your system the more peace of mind you will have that you have made a good buying decision. A warranty can also be a deciding factor between two similar model Fleck Water Softening Systems that you are having trouble deciding between. If they are that close in the way they perform, then go ahead and choose the one that gives you the longer warranty coverage. A warranty also indirectly shows you how much confidence a manufacturer has in their particular product too. 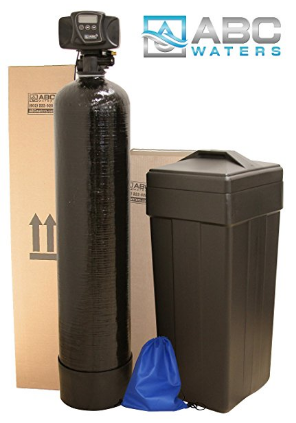 If you have hard water problems at your home, then a water softener is not a want it’s a need. These systems tend to pay for themselves over time in both money and stress relief. If you are going to invest in a water softener, then we don’t see any good reason why you would not want a Fleck Water Softening System. They are efficient, easy to use and even easier to maintain. Any of the models that we reviewed here would be an excellent buy. Just make sure you match the size of your household and the number of bathrooms you have to the size of the water softening system you need. If you do not think any of the very good Fleck Water Softening Systems we reviewed here are to your liking, then what you learned in this article should help you make a sound buying choice. You really can’t beat owning one of these systems if you have hard water problems in your home.